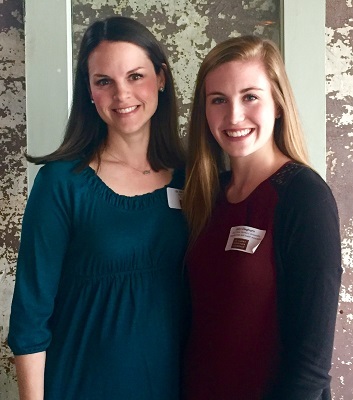 Caitlyn Cleghorn, a first year student in Samford University’s McWhorter School of Pharmacy, has been selected as a member of the inaugural class of Alabama Schweitzer Fellows. Cleghorn, along with 15 other graduate students, including Samford alumnus David Osula, will spend the next year learning to effectively address the social factors that impact health while developing lifelong leadership skills. In doing so, the Fellows will follow the example set by famed physician-humanitarian Albert Schweitzer, for whom the fellowship is named. Schweitzer Fellows develop and implement service projects that address the root causes of health disparities in under-resourced communities, while also fulfilling their academic responsibilities. Each project is implemented in collaboration with a community-based health and/or social service organization. Cleghorn, along with her fiancé Dustin Whitaker, a student in the University of Alabama at Birmingham’s School of Medicine, will implement a medication review system for the St. Vincent’s Health System’s Access to Care program that includes health education for patients and a comprehensive clinical review of each patient’s medications. “The need for medication review systems is growing in our health care system and it is a commodity that many insurance companies already provide to beneficiaries,” said Cleghorn. “The people in the Access to Care program fall in the Medicaid gap, they are uninsured and don’t have access to this type of service. Our goal is to provide a system that helps ensure that they are getting the best results from their medication therapy. We hope to increase their medication adherence and to empower them to take charge of their health to improve their overall quality of life,” she added. For his project, Osula, a 2015 Samford graduate in biochemistry, will develop the Academy of Health Sciences Mentoring Program for local, inner-city high school students who are interested in health care careers. Osula is currently in medical school at University of Alabama at Birmingham. Schweitzer Fellowships have an intensive leadership component, so that Fellows can go on to inspire others to improve the health of those who experience barriers to care. Fellows work under the close guidance of community and academic mentors during their fellowship year. “The fellowship will help me sharpen my leadership and communication skills and prepare me to think critically about how to solve problems unique to every individual’s circumstances,” said Cleghorn. “I’m very excited to see how the relationships I form within this organization enrich my professional experience in the years to come,” she added. Following graduation from pharmacy school, Cleghorn plans to pursue a pharmacy residency and a career in either ambulatory care or clinical pharmacy. According to Sylvia Stevens-Edouard, executive director of The Albert Schweitzer Fellowship, the organization is pleased to bring the fellowship to Alabama. The program is known for having a ripple effect in communities as Schweitzer Fellows improve the lives not only of those they are directly serving, but their circle of family and friends as well; the impact on communities is lasting. The 16 Alabama fellows will join approximately 240 other 2016-17 Schweitzer Fellows working at program sites around the United States, as well as one in Lambaréné, Gabon, at the site of The Albert Schweitzer Hospital founded by Dr. Schweitzer in 1913. Upon completion of their fellowship year, the 2016-17 Alabama Schweitzer Fellows will become Schweitzer Fellows for Life and join a vibrant network of more than 3,200 Schweitzer alumni who are skilled in, and committed to, addressing the health needs of underserved people throughout their careers, said Boggs.